Amber House Bed & Breakfast - Just 8 blocks from the capitol on a quiet street, Amber House offers individually decorated, antiques-filled rooms named for famous musicians and writers. The accommodations are located within historic houses: the Poet's Refuge, a 1905 Craftsman-style home with five rooms, and an 1895 Dutch colonial home called the Musician's Manor. Its Mozart Room is the B&B's best, with a four-poster queen bed, a heart-shaped jacuzzi, a private patio, and three bay windows overlooking the tree-shaded street. A living room and library are available for guests' use. A full breakfast is served at the time and location you request -- either in your room, in the large dining room, or outside on the veranda. Coffee and a newspaper are brought to your door each morning, as are freshly baked cookies every afternoon; and nonalcoholic beverages are offered all day. Citizen Hotel - This hotel, which opened downtown in 2008, is a designer boutique hotel that is part of California's Joie de Vivre collection. The 198-room hotel features a tented meeting space, gym and the trendy Grange restaurant and Scandal bar. Delta King Riverboat - The Delta King carried passengers between San Francisco and Sacramento in the 1930s. Permanently moored in Sacramento since 1984, the riverboat is now a somewhat gimmicky but charming hotel. Staying here can be a novelty, but the staterooms are rather small and may bother landlubbers. All units have private bathrooms and typical low shipboard ceilings. The captain's quarters, a fancy suite, is a unique, mahogany-paneled stateroom, complete with an observation platform, private deck, and wet bar. The riverboat's Pilothouse Restaurant has unparalleled river views. When the weather is nice, many patrons dine on outside decks. Live entertainment is presented below decks in two venues on Thursday through Saturday in the evening. The Mark Twain Salon hosts Suspect's Murder Mystery Dinner Theatre," an interactive whodunit. Hyatt Regency Sacramento - Sacramento's top hotel is in the heart of downtown, across from the state capitol and adjacent to the convention center. It's the high-status address for visiting politicos and is popular with conventioneers as well, as its facilities and services are unmatched in the city. While the rooms themselves are not terribly distinctive, they conform to a high standard and come with all the amenities you expect from Hyatt. The best are the corner units with views facing the state capitol. Inn & Spa at Parkside - Very elegant and gorgeous, but oozes with tranquility and warmth. This is a treasure trove to decompress and chill out in any of the well appointed rooms, the spa facilities or the enchanting grounds. A 1936 mansion at the edge of downtown, this chic bed and breakfast is a short drive or within walking distance of the California State Capitol, downtown businesses, Old Town Sacramento, and the Crocker Art Museum. Ryde Hotel - The Ryde Hotel was built in 1927 at the peak of the prohibition era. It was an opulent establishment, complete with beauty salon and barbershop, that served as a riverboat way station. It was also rumored to be a bordello. The lower level was a speakeasy, offering bootleg whiskey and jazz to a clientele in search of a good time. The Ryde attracted celebrities of all types from President Herbert Hoover to local and state politicians to movie stars and mobsters. 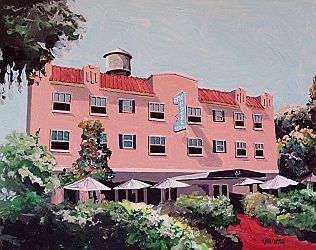 In later years the Hotel became a boarding house for the men and women who built the Delta levees and pioneered the area's thriving agricultural industry. Over time, the Ryde has experienced many incarnations and owners including the Lon Chaney, Jr. family. At one point the name was changed to the Grand Island Inn. During the 1980's it was even a rock'n'roll mecca. The Hotel has resumed its original name and undergone a major renovation, maintaining the character of the original design while incorporating contemporary amenities, such as Jacuzzi tubs, with glorious river views. 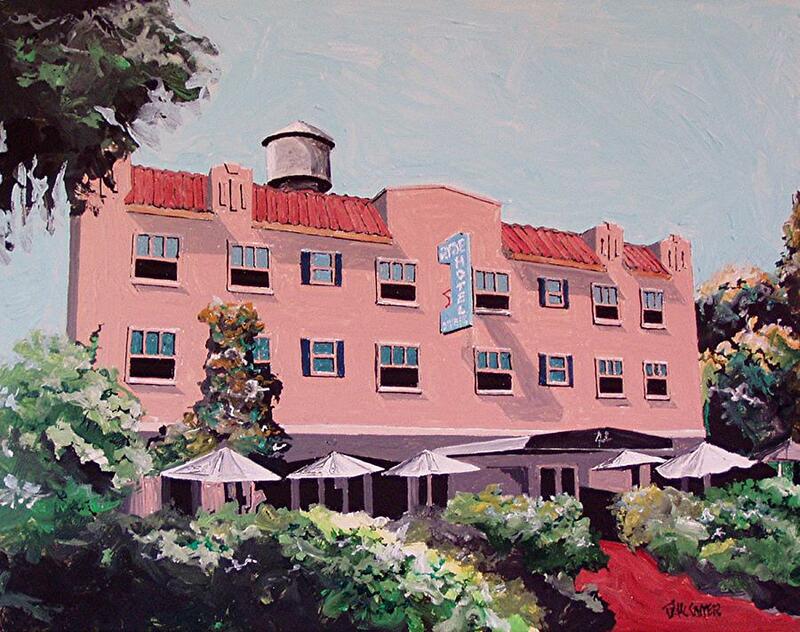 Sterling Hotel - In the heart of Sacramento, 3 blocks from the capitol, this inn occupies a white-fronted Victorian mansion built in the 1890s and heavily renovated in 1995. The Sterling has all the charm of a small, well-managed, sophisticated inn, with a carefully tended flowering yard, tasteful decor, designer furnishings, Italian marble, and a Jacuzzi in every room. The Chanterelle, which serves California regional cuisine, is one of Sacramento's better restaurants. Amador Wine Country - Website of the Amador vintners - thirty four wineries from Amador County in the heart of the historic Sierra foothill Gold Country. On this site, you'll find information about visiting Amador wine country, profiles of member wineries, descriptions of Amador's leading grape varieties and wines, and up-to-date news about special events and other attractions. American River Parkway Foundation (ARPF) - Coordinates the efforts of hundreds of volunteers who contribute thousands of work hours to maintaining and improving the Parkway. The American River Parkway is 23 miles in length and is designated both a state and national Wild and Scenic River. Apple Hill - Apple Hill is located in the western Sierra Foothills in El Dorado County. Just an hour's drive from downtown Sacramento, this locale is filled with fruit orchards, breweries, tree farms, and wineries. It's a perfect out-of-town spot for a quick getaway. Just head out on eastbound US-50 toward Lake Tahoe. As you pass Placerville, you'll start to see several Apple Hill exit signs: the Schnell School Exit 48, Carson Road Exit, Camino Exit, Cedar Grove Exit 54, and Pollock Pines Exit 57. Also see About.com page. 2nd Saturday - Second Saturdays art walk when galleries stay open until 10 p.m. with live music, food vendors and, of course, vino. Art Foundry, The - An upscale venue in the heart of an historic warehouse district that is quickly becoming one of Sacramento's premier art-oriented corridors. The gallery has won a regional reputation for showing exciting contemporary paintings and sculpture from accomplished artists such as Gregory Kondos, John Battenberg, Peter Vandenberg, William Ishmael , Mark Bowles, Nathan Oliveira and Peter Voulkos among many others. Located at 1021 'R' St. Sacramento, (916) 444-2787.
b. sakata garo - Art gallery at 923 20th St., Sacramento. Contemporary paintings, sculpture, ceramics, drawings and prints. B Street Theatre - A two-theatre playhouse on B Street in Midtown. Home to Mainstage, B3 and Family Series, each created to house quality, intimate theatre for audiences year-round. Recognized as one of Northern California's top professional theatres, having produced more than 100 new plays, 60 of which are world, national, West Coast, or regional premieres. California Arts Council (CAC) - This state government agency encourages widespread public participation in the arts; helps build strong arts organizations at the local level; assists with the professional development of arts leaders; promotes awareness of the value of the arts; and directly support arts program for children and communities. Located at 1300 'I' Street, Suite 930, Sacramento. Crocker Art Museum - As the leading arts institution in the Sacramento Valley, the Crocker serves as the primary regional resource for the study and appreciation of fine art, with an emphasis on the original Crocker family donation of California art and European drawings, contemporary northern California art and, more recently, of East Asian painting and international ceramics. Located at 216 'O' St., Sacramento. Sacramento Metropolitan Arts Commission (SMAC) - Established in 1977, SMAC is a public agency devoted to supporting, promoting and advancing the arts in the region. Sacramento Museum Guide - Find a museum. Warehouse Artists Lofts (WAL) - A mixed-use, mixed-income community for artists located in downtown Sacramento's Historic R Street District. California Delta Chambers & Visitors Bureau - The Delta is a fresh-water system primarily comprised of fertile agricultural islands that sit below sea level, but are protected by a stout system of levees. It is fed by five major rivers, including the Sacramento River and the San Joaquin River. There is a remoteness to the lightly populated inner Delta. The lifestyle here is decidedly laid back, a sort of Huck Finn kind of existence. Boating, fishing, and camping are a way of life. Some of the historic river towns are little changed from the Gold Rush era when paddlewheel steamboats came piping their arrival with the steam-driven calliope. Drawbridges yawn open to let boating traffic pass, you cross some waterways on lumbering cable-drawn car ferries, the postman delivers mail by boat. For all its rural charm, the California Delta caters to visitors' needs. It boasts over 100 marinas and waterside resorts, full-hookup RV parks and campgrounds. There are quaint waterside restaurants for dining, grocery stores for provisions, bait and tackle shops, and over 50 boat launching facilities. Public parks and bank-fishing sites are numerous. California State Capitol Museum - The building serves as both a museum and the state's working seat of government. Find out more about tour times, building security, parking, how to get here, and other information related to planning your exploration of the Capitol. Located at 10th and 'L' Sts., Sacramento. California State Fair - Celebrating California. California State Railroad Museum - Located in Old Sacramento, the California State Railroad Museum is a complex of historic facilities and unique attractions. Widely regarded as North America's most popular railroad museum, there is something here for everyone! Throughout the year, experience lavishly restored trains, engaging exhibits, and unique special events. American Legion Post #832 - 1550 Auburn Blvd., Sacramento, (916) 927-7628. Back Door Lounge - 1112 Firehouse Alley, Sacramento (Old Town), (916) 442-5751. Blue Lamp, The - 1400 Alhambra Blvd., Sacramento, (916) 455-3400. Blue Room, The - Capitol City Hotel, 2600 Auburn (near Fulton/Bus. 80), Sacramento, (916) 416-9689. Boardwalk, The - 9426 Greenback Ln., Orangevale, (916) 988-9247. Capitol Garage - 1500 K Street, Sacramento, (916) 444-3633. Club Retro - 6521 Hazel Avenue, Orangevale, (916) 988-6606. Coach's Bar&Grill - 3443 Laguna Blvd., Elk Grove, (916) 226-2905 and 5681 Lonetree Blvd. Rocklin, (916) 580-6540. Crawdad's River Cantina - 1375 Garden Highway, Sacramento (located at Riverbank Marina), (916) 929-2268. David Girard Vineyards - 741 Cold Springs Road, Placerville, (530) 295-1833. Delta King [Delta Bar and Grill] - 1000 Front St., Sacramento (Old Town), (916) 444-5464. Elk Grove Sports Bar - 9661 Elk Grove-Florin Rd., Elk Grove, (916) 685-6103. Fire Escape, The - 7431 Madison Ave., Citrus Heights, (916) 967-5464. Firestone Public House - 11132 16th St., Sacramento, (916) 446-0888. Folsom Hotel Saloon - 703 Sutter St., Folsom, (916) 985-2530. Fox & Goose - 1001 'R' St., Sacramento, (916) 443-8825. Hacienda Del Rio - 702 Sutter St., Folsom, (916) 351-1800. Harlow's - 2708 'J' St., Sacramento, (916) 441-4693. Jan's Lounge - 9222 Greenback Ln., Orangevale, (916) 989-0583. JB's Lounge, Red Lion Hotel - 1401 Arden Way, Sacramento, (916) 922-8041. Louie's Cocktail Lounge - 3030 Mather Field Rd., Rancho Cordova, (916) 362-9151. Lowbrau Bierhall - 1050 20th St. (The Marrs Building), Sacramento,(916) 706-2636. Marilyn's On K - 908 'J' Street, Sacramento, (916) 446-4361. Monkey Bar - 2726 Capitol Ave., Sacramento, (916) 442-8490. Old Ironsides - 1901 10th St., Sacramento, (916) 442-3504. Oshima Sushi Sports Bar and Restaurant (Fugu Lounge) - 2071 Natomas Crossing Dr., Sacramento, (916) 515-1958. Po' Boyz Bar & Grill - 9580 Oak Avenue Pkwy., Folsom, (916) 987-2886. Powerhouse Pub - 614 Sutter St., Folsom, (916) 355-8586. Purple Place, The - 363 Green Valley Road, El Dorado Hills, (916) 933-2616. River City Saloon - 916 2nd St., Old Sacramento, (916) 443-6852. Shady Lady Saloon - 1409 'R' St., Sacramento, (916) 231-9121. Sheraton Grand - 1230 'J' St., Sacramento, (916) 447-1700. Station, The - 1100 Orlando Ave., Roseville, (916) 722-2405. Tex Wasabi's - 2243 Arden Way, Sacramento, (916) 927-8399. Torch Club, The - 904 15th St., Sacramento, (916) 443-2797. Vega's - 910 2nd St., Sacramento (Old Town), (916) 706-3502. Delta California - California Delta Regional information including links to restaurants, rentals, marinas and RV parks. There are over 1000 miles of waterways, over 300 restaurants to sample, and fun resorts. El Dorado Wine Country - Just about an hour from Sacramento or South Lake Tahoe and a little over two hours from Reno or the San Francisco area, El Dorado's wineries beckon visitors with a wide diversity of award winning wines, friendly tasting room staffs and idyllic views of snow-capped mountains and oak-studded foothills. Fairytale Town - A 2.5-acre children's play park and outdoor children's museum that brings fairytales and nursery rhymes to life. Located at 3901 Land Park Drive, Sacramento. Folsom City Zoo Sanctuary - Since 1963, this small unique California zoo has been providing sanctuary to some very special animals. All are non-releasable. Many were raised, and rejected, as wild pets. Others were injured or orphaned in the wild. Most are native to North America. The zoo is located in Folsom City Park at Natoma and Stafford Streets at 403, Stafford Street, Folsom. Folsom Lake - Folsom Lake is a reservoir in Northern California about 25 miles northeast of Sacramento in Placer, El Dorado, and Sacramento Counties. The lake is formed by Folsom Dam, constructed in 1955 to control the American River. The dam and lake are part of the Folsom Project, which also includes the Nimbus afterbay reservoir and dam facilities. The Folsom Lake State Recreation Area is managed by the California Department of Parks and Recreation. The 18,000 acre lake and recreation area offers opportunities for hiking, biking, running, camping, picnicking, horseback riding, water-skiing and boating. Fishing offers trout, catfish, largemouth and smallmouth bass or yellow perch. Visitors can also see the Folsom Powerhouse (once called "the greatest operative electrical plant on the American continent"), which from 1885 to 1952 produced 11,000 volts of electricity for Sacramento residents. For cyclists, there is a 32-mile long bicycle path that connects Folsom Lake with many Sacramento County parks before reaching Old Sacramento. The park also includes Lake Natoma, downstream from Folsom Lake, which is popular for crew races, sailing, kayaking and other aquatic sports. Folsom Parks and Recreation - P rovides and maintains a full range of recreational activities and park facilities for the community. Park and facility locations are mapped by Google here. Governor's Mansion - California's executive mansion, popularly known at the Governor's Mansion, was built in 1877 for Albert and Clemenza Gallatin. Albert was a partner in the Sacramento hardware store of Huntington & Hopkins. The State of California purchased the house from Joseph and Louisa Steffens to use as a home for California's first families in 1903 for $32,500. Governor George Pardee, his wife Helen and four daughters were the first residents of the "newGovernor's Mansion. During the next 64 years it was home to the families of 12 other governors. Among these were Nina and Earl Warren with six children, and Nancy and Ronald Reagan with their two children. Warren later became Chief Justice of the United States Supreme Court, and Reagan became president of the United States. Today's guests see marble fireplaces from Italy, gold framed mirrors from France, and exquisitely handcrafted hinges and doorknobs, all of which are reminders of the Gallatins and the Victorian era. Outside some of the Mansion's abundant vegetation includes flowers, shrubs, and trees dating back to 1877. But when visitors look behind the grape stake fence and see Governor Brown's swimming pool built in 1959, they are reminded that the Governor's Mansion State Historic Park is really a walk through time. Jedediah Smith Memorial Bike Trail - Bond with the American River by riding along the Jedediah Smith Memorial Bike Trail, a 32-mile loop that snakes along the water and through a series of parks featuring sand dunes, oak groves, picnic areas and fishing nooks. City Bicycle Works [2419 K Street, Sacramento, (916) 447-2453] is less than a mile from the trail, has rentals starting at $5 an hour and $20 a day. Land Park Area Parks - A mapping of the various parks and their amenities. Leland Stanford Mansion - After a 14-year, $22 million restoration and rehabilitation, the Mansion is now open to the public as a museum. It also serves the citizens of California as the state's official reception center for leaders from around the world. Originally built in 1856 by Gold Rush merchant Sheldon Fogus, the Mansion was later purchased and remodeled twice by Leland and Jane Stanford. Leland Stanford served as Governor of California from 1862-1863. The Mansion served as the office of three governors during the turbulent 1860's - Leland Stanford, Fredrick Low and Henry Haight. Crest Theatre - The site that the Crest Theatre sits on has housed a theatre since 1912. The first, the Empress, was a vaudeville theatre which opened in 1913. The second, The Hippodrome, was originally a vaudeville house which converted to a motion picture theatre in the late 1920's. In 1946, the Hippodrome interior was demolished and the Crest was built inside the Hippodrome building shell. The theatre then began to showcase films for thirty years, until late 1979 when a variety of factors including the decline of the K Street mall, television and the multiplex forced it to close. In 1995, the Crest received a one million dollar restoration bringing Sacramento's last picture palace back to it's glittery 1940's appearance. The Crest boasts one of the most elegant settings Sacramento has to offer, featuring a fabulous gold leaf art deco interior. Located at 1013 K St., Sacramento, (916) 44-CREST. See Calendar. Tower Theatre - Movie theater at 2508 Land Park Dr., Sacramento, specializing in art and independent films. Built in 1938, the Tower Theatre is a Sacramento landmark. In the 1980s, the single screen auditorium was divided into three smaller ones. The exterior, however, has remained in its original form, including still-working multi-colored neon lights. Old Sacramento - This unique 28-acre National Historic Landmark District and State Historic Park is located along the beautiful Sacramento River. Bustling with activity, the district is alive with shopping, dining, entertainment, historical attractions and world-renowned museums set within the time of the California Gold Rush and the Transcontinental Railroad. Also see Historic Old Sacramento Foundation site. American River College Theatre - Produces theatre from musicals to the classics, avante-garde to Shakespeare. It's beautifully remodeled facility contains two performing spaces: the Theatre, a large 350 seat proscenium house with a fly loft and orchestra pit, and Stage 2, a small intimate flexible space. California Musical Theatre - Northern California's premiere producer and presenter of musical theatre - the largest nonprofit musical theatre in California. Guild Theater, The - An urban center for performing arts and cinema. The Guild Theater is the only remaining theater of the numerous early 20th century motion picture houses for which Oak Park was once known. Designed and financed by Joseph Lewis and completed in 1915, it was the largest of three theaters on 35th Street in Oak Park at that time. Originally called the Victor Theater, the building's structure reflected the influence of the Moorish Revival on theaters of that era. Located at 35th St. and Broadway (2828 35th St.) in the heart of Oak Park. See Event Calendar. Harris Center - Presentations from artists from around the world are brought to Folsom Lake College through the operation of this $50 million, 80,000 square foot regional arts center. Mondavi Center - Explores the full range of the performing arts, from the traditional to the innovative, and from diverse cultures and disciplines through presentation, education, public service, and research. As part of the UC Davis mission as a land grant university, Mondavi Center provides outstanding cultural programming, support for the University's academic departments, and a professional laboratory to train students in the performing arts. Power Balance Pavilion - Events ranging from NBA and WNBA games to Disney on Ice shows. ARCO Arena has hosted world-famous acts such as the Rolling Stones, Elton John, Garth Brooks, U2, Justin Timberlake, Tim McGraw & Faith Hill, Paul McCartney, and a growing roll call of the biggest names in entertainment. Sacramento Music Festival - Held every Memorial Day weekend in Old Sacramento, Raley Field and several downtown/midtown locales. Sacramento Opera Company - Producing outstanding opera. Sacramento Philharmonic Orchestra - Classical music. Sacramento Theatre Company (STC) - From September to June, eight performances each week, for a total of more than 300 each year. Classical and modern plays. The Mainstage seats 292 patrons in three sections surrounding the stage. Each seat offers audience members clear views and a "front row" feel. The Pollock Stage is an intimate 85-seat theatre featuring a number of new works and productions in development. With only three rows of seats, the audience feels a part of the action on stage. Three Stages - A $50 million facility at Folsom Lake College dedicated to the performing and visual arts. Artists arrive from around the world, and throughout the community, to the newest arts venue in the capital region. Mother Restaurant - 1023 K St., Sacramento, (916) 594-9812 [Vegetarian]. Riverbank Marina - Unique water-front neighborhood, marina, restaurants. RPM Indoor Kart Racing - Feel the adrenaline rush of a real racer at RPM Indoor Kart Racing. From safety gear to high-powered 9HP Honda engines, it provides everything you need to feel the power and drive of extreme speed excitement. Located at 3130 Bradshaw Road, Sacramento. Sacramento 365 - Year round resource for Sacramento events. Sacramento Blues Society - Founded in 1979, one of the oldest blues societies in California. Sacramento Kings - NBA basketball at Sleep Train Arena. Sacramento Natural Foods Co-op - Supporting sustainable agriculture since 1973. Located at 1900 Alhambra Blvd., Sacramento. A Guide to Sacramento Neighborhoods - From Moving Day. City-Data Neighborhood Map - Income, house prices, occupations, boundaries. Great Neighborhoods - September 2010 Sacramento Magazine article. Most Walkable Neighborhoods - April 2009 Sacramento Magazine article. Neighborhood Maps and Boundaries - From City of Sacramento's Parks and Recreation Department. Sacramento Parks and Recreation - Links and information to all Sacramento parks is found here. OnTheMarketRealty - Sacramento real estate search. Paula Swayne - Specializing in Sacramento's finest older neighborhoods. RealEstate.com - Sacramento listings and real estate guide. Realtor.com - Single family homes, condos, townhomes and row homes, mobile homes for sale. Sacramento Homes for Sale - From Redfin. Zillow - Sacramento real estate and homes for sale. Sacramento Zoo - Open since 1927, the Sacramento Zoo is home to over 140 native, exotic and endangered species and is one of over 200 accredited institutions of the Association of Zoos and Aquariums. Located near the corner of Land Park Drive and Sutterville Road in Land Park, the Zoo is wholly managed by the non-profit Sacramento Zoological Society and provides an educational and recreational resource to the Sacramento Region. Beer's Books - Quality new and used books. Folsom Premium Outlets - 80 outlets: Aeropostale, BCBG Max Azria, 2b Bebe, Brooks Brothers, Calvin Klein, Gap Outlet, Guess, Coach, Kenneth Cole, Nautica, Nike, Puma, Saks Fifth Avenue Off 5th, Samsonite, Tommy Hilfiger, Zales Outlet and more. Located at 13000 Folsom Blvd., Folsom. K Street Mall - Spanning 7th Street to 13th Street, K Street Mall has shopping, dining and entertainment. Marrs - Shopping district in heart of downtown Sacramento. Art, retail, restaurant scene. Old Sacramento - Over 100 shops to choose from in this historic district. Pavilions - Everything from the glamour of designer fashions to casual jeans, artwork, home furnishings, cookware, accessories, jewelry, and footwear. Relaxed shopping in one-of-a-kind stores and dining at some of Sacramento's finest restaurants. See Shops and Restaurants Directory. Sunrise Mall - See Directory. Town and Country Village - Shops and restaurants. See Directory. Located in Sacramento, California at the corner of Fulton and Marconi Avenues. Vacaville Premium Outlets - 120 outlet stores: Find impressive savings at Adidas, Ann Taylor, Banana Republic, BCBG Max Azria, Burberry, Calvin Klein, Coach, Cole Haan, Gap Outlet, Gucci, Guess, J.Crew, Nike, Polo, Puma, Ralph Lauren, True Religion, Tommy Hilfiger. Located between San Francisco and Sacramento. Located at 321 Nut Tree Road, Suite 2, Vacaville. Westfield Downtown Plaza - Within walking distance of the State Capitol, Convention Center and many historic tourist destinations. Houses the area's only flagship Macy's stores and Century Theatres. Sky Drifters - Hot air balloon service for the Sierra Nevada foothills. Call 1-888-359-0484. Sunday Certified Farmers' Market - Eighth and 'W' Streets. Open year round from 8 a.m. to noon, the market offers a bounty of white pomegranates, Asian pears, fragrant persimmons, harvested honey, farm-fresh eggs, cut flowers and just-caught fish. It feels like a festive street fair, with nothing but delicious foods. Sutter's Fort - A state-protected park that includes Sutter's Fort and the California State Indian Museum. Begun in 1839 and originally called New Helvetia (New Switzerland) by its builder, John Sutter, the fort was a 19th century agricultural and trade colony in California. The fort was the first non-Native American community in the California Central Valley. It is famous for its association with the Donner Party, the California Gold Rush and the formation of Sacramento. Notable for its proximity to the end of the California Trail and Siskiyou Trails for which it served as a waystation. See Wikipedia article. Time Tested Books - New, used, out-of-print and rare books. A great book experience with events such as author signings, readings, lectures and music performances. Voters for a Fair Arena Deal - Committed to allowing a public vote on the Sacramento Entertainment and Sports Complex project, and towards advocating for a deal which is equitable, fiscally responsible, and appropriately risk-managed. Weather Forecast - 10-day weather forecast for Sacramento. This webpage last updated on Monday, January 21, 2019 12:08 PM.